it makes sense: not only that the immediate, visible ROI generated by online advertisements is lower, but the efficacy of an online advertising campaign is questioned, when the users seem to ignore banner ads, pop-ups and the like. Advertising experts predict that advertisers will spend more online than in newspapers by the end of the year, but it is still difficult to predict how successful these advertisements will be, when online advertisers are poorly educated about how to use the various advertising channels available. Now Google and WPP Group have joined forces to promote “science-based” researches on how traditional and online advertising affect consumer choices. Until they come up with the “science” I can only tell you what I learned from seven years of online advertising experience, but first, let’s take a look at the numbers in the UK. Advertising spend in newspapers declined 12% last year, but the newspapers still took 25% market share. Internet advertising followed after TV with 20%. 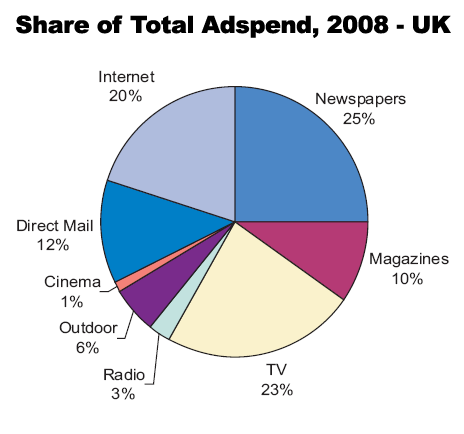 UK experts believe that this year the Internet will occupy the top position in advertising spend. AdWords and the like are just a form of advertising – from a ROI point of view probably the most effective, but remember that there is a time and a place for everything. A good advertising campaign online should take into consideration demographics, interests, peoples’ preferences (likes and dislikes) and needs. Banners are often generating the lowest ROI – because web users simply do not click on such ads – of course, unless the ads in question have a very enticing design and message. Creating the perfect design for a banner has always been a challenge. Many marketing experts already wrote enough about this, there is an article that might help at eWritings too. The problem with online advertising is that the advertisers are blinded by click-through and often disregard the branding aspects and the long term benefits of banner advertising for example. Online or offline, the challenge for the advertising industry is to understand that the consumers might not have an immediate need to purchase a product and that banner advertising (when done right) can have a huge impact on branding. A banner can lead to a site visit independent of “click-through.” A web user may remember the name of a company months after being exposed to a banner – let’s not forget that images and symbols are what sticks with our memory best. Use large logos (at least 15% of the banner space) to create brand awareness. Use human faces – they give the suggestion of friendship, confidence and familiarity. The presence of a human face increase customer interest, subconsciously. Use short sentences, clear calls to action that motivate, entice and persuade. Large banners (for example 468×60) perform better than small banners (125×125). Banners seen with high frequency have a greater impact on building brand awareness than banners with a lower rate of occurrence. Banners with dynamic images (Flash animation, video) have a greater impact than stating banners. This doesn’t include banners with flickering messages like “new”, “click here” etc – which are purely annoying. Advertise on niche related sites – only these are visited more often by people who may be interested in what you have to offer. Without “site usage” it’s hard to evaluate the quality of a site. See how many comments appear under each blog post. They are indicative of user involvement and site usage. Join the discussion and share your tips, ask your questions and state your opinions. In your experience, what type of banners work best and why? Great post! I`ve done a little banner advertising and never had a great response . . . but I also didn`t use any of your tips, which might be why! Thanks. Genesis’s last blog post..Party Time! The internet advertising is definitely a big opportunity, especially for those small business and entrepreneurs. Hence, everyone would like to have a taste on this “lion’s share” for sure, Mig. The downturn in the economy is going to effect all aspects of advertising pa. As with anything though, it will eventually even out and business will be as usual. It’s the time of online advertisements! Hisham’s last blog post..Why I will ask Jeeves or be a Fan of his New Facebook Page? The fluctuations of banner ads in the present years have been lowering the confidence in online entrepreneurs as visitors do not get incited by its special effects and messages. Thanks for this informative blog which still upholds reasons for the potentiality of banner ads in the near future.